Georgia Southern University has five cyber-related academic programs giving our students the best selection of Cyber related degree programs in the University Systems of Georgia. Please review the information and links below for more information on our programs. 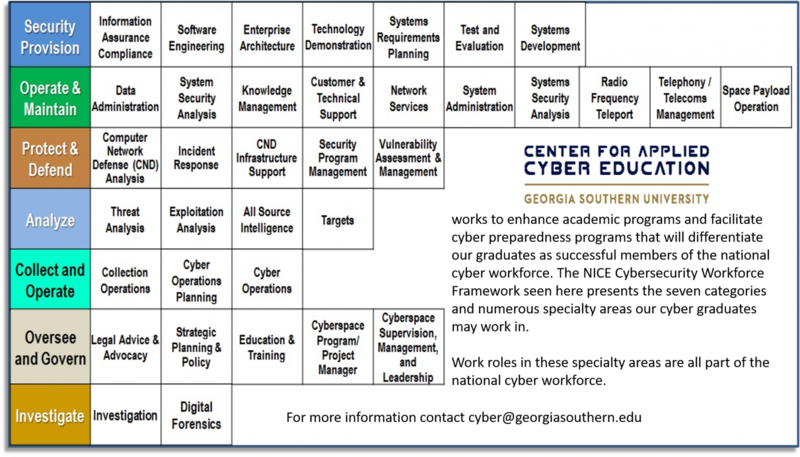 The Center for Applied Cyber Education does not control any cyber-related academic programs, but we are here as advisors and to help answer questions about which programs fit bets for your future in alignment with the National Cyber Workforce Framework. Interdisciplinary Minor in Cyber Security – designed for students who are already enrolled in a baccalaureate degree program. In addition to basic information technology (IT) courses, it requires three courses in cybersecurity and one course in cyber forensics. The Cyber Security Minor is only available at the Armstrong Campus in Savannah. M.S. in Information Technology – The Master of Science in Information Technology (MSIT) degree program at Georgia Southern integrates state-of-the-art technology and interdisciplinary and conceptual science with hands-on, operational skills preparation. Graduates gain valuable knowledge and are placed in a unique position to make an immediate impact on their career and their employers. Cyber Security Undergraduate Certificate – designed for students who do not intend to earn (another) college degree, but want to obtain certification in the growing cybersecurity field. It requires prerequisite math and IT courses as well as three cybersecurity courses. The Cyber Security Undergraduate Certificate is only available at the Armstrong Campus in Savannah. Bachelor of Science in Criminal Justice, Cyber Crime track – designed for students who want an interdisciplinary degree that prepares them for the demands of the marketplace. Its graduates have been successful in garnering well-paying jobs in cybercrime and cyber forensics. Minor in Cyber Crime – designed for students who are already enrolled in any baccalaureate degree program who are interested in obtaining a concentration in cyber forensics/cyber crime. Graduate Certificate in Cyber Crime – This post-baccalaureate certificate builds on students’ baccalaureate degrees and may also serve as a stepping stone toward the Master of Science in Criminal Justice degree. Bachelor of Health Science, Health Informatics Track – prepares students for entry-level careers in the rapidly growing field of health informatics and health information systems selection, implementation and management, and cyber security of systems and information in the healthcare industry. 4) BBA in Information Systems – The Enterprise Security (ES) emphasis focuses on the development and administration of security policies as they pertain to the management of information systems. Master in Accounting – The Forensic Accounting emphasis focuses on utilizing masters level accounting skills to assist in legal matters that need accounting, auditing, and investigative support. It encompasses three main areas – litigation support, investigation, and dispute resolution. Department of Defense Forensics Analyst Credentialing – CACE is a Center of Digital Forensics Academic Excellence through the Defense Cyber Crime Center. This provides us with an articulation agreement with the Defense Cyber Investigative Training Academy (DCITA). Taking coursework from criminal justice and IT qualifies those that complete just three courses to hold credentials as a DoD Digital Media Collector and/or a DoD Digital Forensic Examiner. If you work in a DoD agency as a service member, civilian, or contractor after completing this program you can apply to DCITA to be granted DoD certification as either a DoD Digital Media Collector and a DoD Digital Forensics Examiner. Taking IT1231 and CRJU5010 will complete requirements for qualification as a DoD Digital Media Collector. Taking all three courses listed above will complete requirements for qualification as a DoD Digital Media Collector and a DoD Digital Forensics Examiner.